But is “The pissed off barber” speaking the truth? I’ve spoken to quite a few barbers who say yes; whereas some say he’s just after the laughs at anyone’s expense. Does the truth hurt? Do the subjects of his posts take themselves too seriously, therefore making themselves a target? I was brought up to always tell the truth, but then again, Mum also said ‘if you can’t say anything nice, don’t say anything at all’ and I often say things that aren’t particularly nice, but they’re quite funny( well I think so). I personally enjoy his humour because I like laughing at people. Call me cruel, but I don’t care! The trouble is, people are taking themselves so seriously nowadays, that they must exhaust themselves living up to their online persona. 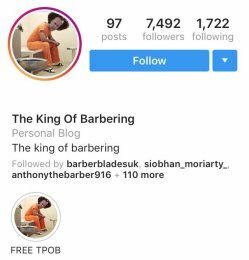 There’s a lots of naturally flamboyant characters that are carving a niche for themselves in barbering right now (naming no names) and they have a lots of support. However, there’s an awful lot of pretenders out there too, simply emulating others but sadly just falling into the trap of playing dress up and looking ( in my opinion) a bit daft. If you’re wearing a fuscia fedora, and lilac trousers or you wear white cowboy boots and a psychedelic suit, then I hope to God you can carry it off! If you’re 48 and dress like an extra for a Good Charlotte video… oh dear. If you’re dressed in a tweed suit & cap in August and you don’t suffer heat exhaustion, I hope you’re comfortable in yourself. My point is, if you’re dressing in your own personal style, and someone takes the piss, so what? None of it means you’re in the wrong for wearing individual clothes, it just means you’re trying your hardest to stand out, so don’t be shocked or annoyed if someone takes the mickey. Put on your big girl pants and deal with it! Any way I can’t stay chatting; my purple pantaloons are ready for collection!